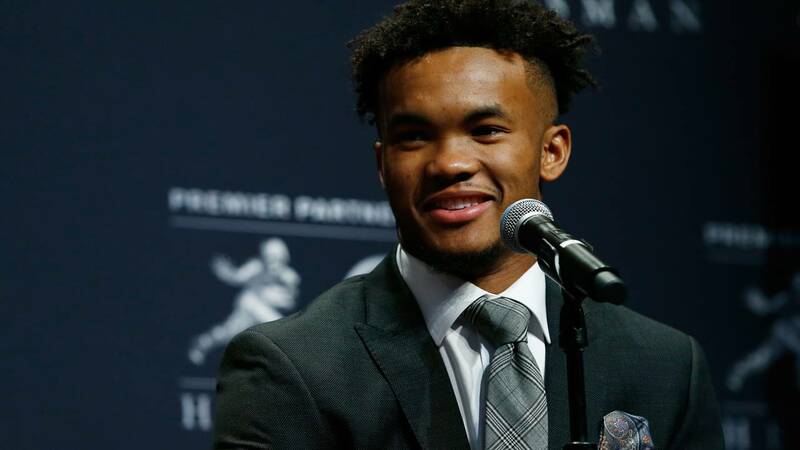 Kyler Murray of Oklahoma speaks at the press conference for the 2018 Heisman Trophy Presentationon December 8, 2018 in New York City. 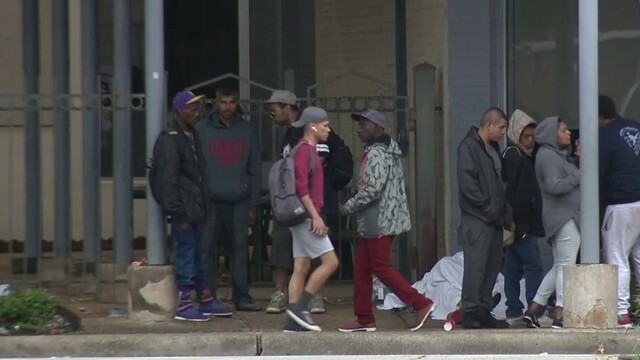 (CNN) - Oklahoma quarterback Kyler Murray is the latest in a long line of elite football players to win the Heisman Memorial Trophy. The trophy is awarded each year to "most outstanding football player in the United States." Murray's win marks the first time since 1945-46 that two different players from the same school won the award in back-to-back seasons. "I've worked my whole life to fulfill my goals. There's a higher power looking down on me," Murray said. "This is an honor. It's something I'll never forget and something I'll cherish for the rest of my life." A fourth-year junior at the University of Oklahoma, Murray follows 2017 Heisman winner and fellow Sooner Baker Mayfield for the award. Mayfield, who now plays for the Cleveland Browns, tweeted his excitement Saturday night. "LETSSSSS GOOOOOO!!!!!! BACK TO BACK" he tweeted. Mayfield then added to his praise on Instagram, saying how proud he was of Murray. "AND THATS WHAT WE CALL BACK TO BACK. YOU DESERVE IT K1," his post read. "So proud of you man. Enjoy every second of it. Absolutely nobody can put a ceiling on you ... Football or baseball, follow your dreams brotha. K1!!!!! Welcome to the Heisman family #OUDNA." Washington Redskins running back Adrian Peterson also praised Murray. Peterson also played for Oklahoma before being drafted in 2007. "@TheKylerMurray Congratulations! I'm so proud to be a Sooner! May the Lord continue to bless and cover you along your journey! #Heisman2018 #BoomerSooner." Murray is seventh Sooner to win the Heisman and the 10th to be a finalist, according to Heisman.com. The 5-foot-10, 195-pound quarterback from Allen, Texas, leads the nation in passing efficiency with a rating of 205.72, according to the NCAA. Heisman's website states that he led Oklahoma to a Big 12 title, a 12-1 overall record and a No. 4 ranking in the College Football Playoff. Murray is also a Major League Baseball first-round pick. He signed a $4.66 million deal with the Oakland Athletics in August. The Athletics also sent out a celebratory tweet on behalf of Murray. "Turns out, he knew. Congratulations to the 2018 Heisman Trophy Winner @TheKylerMurray! #KylerKnows," the tweet read. The Heisman Memorial Trophy is named in honor of longtime college football coach John W. Heisman, who was also the athletic director of the New York Downtown Athletic Club.